Friends. Comrades. Our cinematic empire is growing. Last night we not only occupied neutral territory, we acquired extra recruits to the MNFC army. Yes, more people are coming to realise that dictatorship is for the greater good, and can be fun too! I like to think that this was reflected in our film - Zhang Yimou‘s Hero. Well, the dictatorship bit at any rate. I think that as well as being good, wholesome fascist fun, I think that last night was a learning experience, so I’d like to recap the night’s lessons and throw in a few extra ones. 1. The principle of 2 for 1 is a Good Thing, particularly when applied to burgers and cocktails. The Diner at the Exhibit provided some mighty fine drinks and burgers, and I know that everyone wanted a bite of Jon’s big cheesy dog. 2. No matter how late you think you are, Matt will always be later. 3. Original version dialogue with subtitles is always better than having to sit through badly dubbed dialogue, especially when they even translate ‘Aaaarrgh’! Having said that though, we did get a brief but amusing taste of a variety of accents whilst flicking through to find the Mandarin soundtrack. 4. If you want to exit a cinema without disturbing anyone’s viewing, crawling across the floor in front of the screen is perhaps not the best way to go about it. However, it can provide some unexpected light relief. 5. More thought needs to be put into the design of ladies toilets. We were left feeling extremely jealous of the men when we heard about the lavatory version of in-flight entertainment (in-piss entertainment? urinary gaming?). 6. Of all the actors playing the main characters in the film, only Jet Li as the nameless hero and Donnie Yen as the assassin Sky are fully trained in martial arts. Both men are widely respected masters of wushu, and the prospect of seeing them fighting each other on screen in Hero had the fanboys salivating. Maggie Cheung, Tony Leung and Zhang Ziyi, who played Flying Snow, Broken Sword and his servant Moon respectively, are respected as actors across a range of genres and have only learned martial arts for film roles. With the exception of Yen, all the main actors are among the most recognised stars of Chinese cinema in the West. Cheung and Leung have starred together in a number of films, most notably In The Mood for Love and 2046 both directed by Wong Kar Wai, and are sometimes referred to as the Chinese answer to Humphrey Bogart and Lauren Bacall. See more about Tony Leung and my theory about successful Chinese films in the Tuesday Review for Chungking Express (24.5.11). 7. Floaty silk clothing + long shiny hair + a wind machine + slow motion = a Very Good Thing. One of the main reasons I chose the film to show on the big screen because it is so visually stunning, and I think everyone came out of the screening with taste for top knots and a pressing desire to invest in some silk! Zhang Yimou is well known for his striking use of colour and his perfectionism; in order to find exactly the right shade of red for the clothing in the red sequence he had a special dye shipped over from the UK which the costumer designer ended up dying the fabric for the costumes herself. Zhang also directed the opening and closing ceremonies of the Beijing Olympic games. That’s got nothing to do with the rest of this particular lesson, but I thought it was too good a piece of trivia to leave out. You’ll thank me at some future pub quiz. 8. 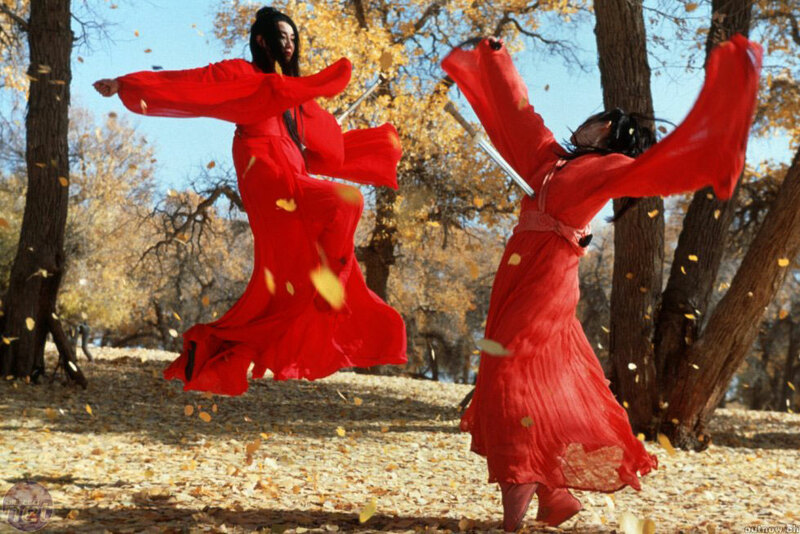 I like to think that Zhang Yimou was inspired to make Hero by Bonnie Tyler waving her floaty sleeves around on a desert mountaintop in this particular work of genius. (This isn’t really a lesson to be taken from this film. I just made it up to get that video in the Review). 9. There was some controversy when the film came out, as many critics felt that it sought to romanticise the story of a tyrannical ruler, and seemed to justify the suppression of the rights of the individual for the good of the collective. There was also a debate about the translation of the phrase ‘tian xia’, which Broken Sword used to try and explain why he felt that the King of Qin should not be killed. The version released in the America translated it as ‘our land’, where it is more normally used to signify ‘all under heaven’ or the whole world. 10. Jet Li appears to have been inspired by the ideal of working for the greater good and has set up a charitable foundation with the governing principle ‘There is only ONE Earth. Each of us has only ONE life. We share the planet, and that makes us ONE global family. By helping others, we are also helping ourselves. Together we can overcome any challenge or difficulty.’ Consider this your final and most meaningful lesson of the day.